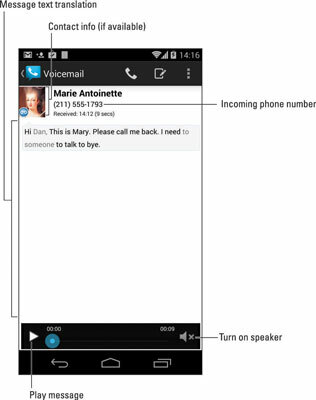 Google Voice transcribes your voicemail messages, turning the audio from the voicemail into a text message you can read. The messages all show up eventually in your Gmail inbox, just as though someone sent you an e-mail rather than left you voicemail. It’s a good way to deal with your messages, but not the best way. The best way to handle Google Voice is to use the Google Voice app, available from the Google Play Store, although you may find a copy already dwelling in the phone’s apps drawer. After the Google Voice app is installed, you have to work through the setup, which isn’t difficult: The goal is to switch over the phone’s voicemail number from the carrier’s voicemail system to Google Voice. Eventually, you see the app’s main interface, which looks and works similarly to an e-mail program. You can review your messages or touch a message to read or play it. When new Google Voice messages come in, you see the Google Voice notification icon, as shown in the margin. To read or listen to the message, pull down the notifications and choose the item labeled Voicemail from whomever. With Google Voice installed, you see two notices for every voicemail message: one from Google Voice and another for the Gmail message. The Google Voice app works only after you acquire a Google Voice account and add your Android phone’s number to that account. The text translation feature in Google Voice is at times astonishingly accurate and at other times not so good. The text Transcript Not Available appears whenever Google Voice is unable to create a text message from your voicemail or whenever the Google Voice service is temporarily unavailable.